An inspiring office space is crucial to motivating and engaging staff; by combining a good office design with environmental considerations, you can improve productivity, profitability and reduce your carbon footprint. Office design involves integrating various elements of furnishings, including partitioning, furniture, flooring, artwork and lighting to create an overall effect. Plenty of natural light, comfortable furniture and decent sized workspaces are a given; access to decent-sized kitchen facilities and break-out rooms should also be a top priority. Give your office an attractive colour scheme by integrating brand colours into wall paint, furniture, pictures and carpets. For example, 120 Edmund Street in Birmingham combines an earthy color scheme with impressive, minimalistic designs. Natural colour schemes combined with large windows and natural light will encourage positivity, communication and productivity, as well as reducing lighting requirements and wasted energy. Combine with some modern furniture for stylistic effect, ensuring that desk arrangement encourages interaction between team members and chairs are comfortable and supportive. Environmental furniture, including cardboard shelving and desks, energy saving desk lamps, recycled plastic pens and notepads can also help create a green culture. To further green behaviour, introduce posters educating and motivating staff; install recycling bins, “think before you print” reminders and create a cycle to work scheme. Installing loft and cavity wall insulation will also save you energy and reduce costs; water conserving taps will significantly reduce water wastage. Your company’s line of business will heavily influence your office design, although most businesses should reflect values of being environmentally friendly, creative, organised and mindful of their staff. An accountancy firm, for example, will use different design themes to an advertising firm. Professional services firm Deloitte predominantly uses natural colour schemes, with common use of pure white to reflect a culture of professionalism and attention to detail; minimalistic furnishings also project their modern approach to traditional services. Advertising or technology firms, on the other hand, will aim to project a feeling of creativity and boundlessness. Their offices will contain impressive creative themes, artistic furniture and extravagant use of colour. Workspaces are often redefined to encourage collaboration and lateral thinking. Facebook’s offices, for example, include chill-out style workstations, soft furniture and urban wall art; Parliament’s office is designed like a log-cabin, built from hand-crafted timber. For creative firms their workspace is their identity: the more extravagant the design, the more innovative the organization is perceived. Research has shown that allowing staff to decorate their workspace can encourage teamwork and engagement. You should also purchase artwork which reflects staff members’ way of life, making them feel valued; for example, a staff member who loves baking bread could have artwork close to their desk which alludes to baking. Encourage staff to move away from their desks when working collaboratively; adopt Facebook style chill-out zones where employees can use laptops or problem solve over a hot drink; encourage staff to dress casually, it immediately changes the atmosphere of the office and removes stifling, traditional ways of working. Open plan offices designs Redheughs Rigg in Edinburgh allow departmental viability and encourages cross-functional interaction. You can also reduce your environmental impacts by minimising overall special requirements. In any given day up to 60 per cent of desks are unmanned, with excess space requiring energy to heat and light; encourage staff to work remotely or implement a shared desk policy. Just because your company is small, do not feel constrained by your budget or traditional workplace values. Your workplace should reflect your entrepreneurial character traits of being independently minded, creative, authoritative and risk-taking; dare to be a little bit different, your staff will recognise and appreciate it. Thanks for sharing this! 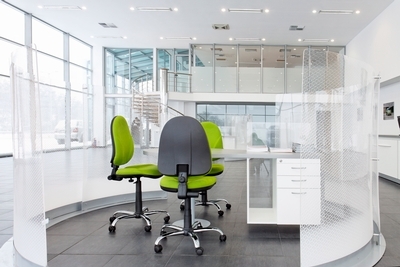 I agree that office design is one of the factors that make employees more productive. I would like to work in the office that looks like this. and end-users with everyday low prices and personalized service. So true, good office design can play an important role in creating a productive working environment.